This is an OEM, dual-mass flywheel for the 2002 - 2005 B6-A4 3.0 V6. These flywheels have been known to fail by separating at the inner bearing that connects the two pieces of the unit. This failure can cause RPM dependent vibrations that will shake the entire vehicle. In extreme cases of failure, we have seen the flywheel shear into two pieces and cause damage to the bell housing. 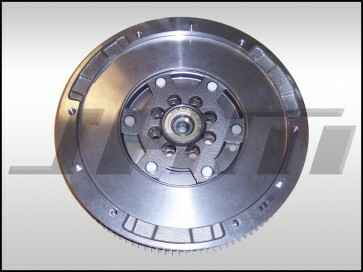 INCLUDES THE FOLLOWING -OEM Flywheel - New Pilot Bearing (already pressed in). Don't forget to purchase 8 new flywheel bolts also available in this section, these MUST be replaced each time the flywheel is removed or replaced. NOTE: Flywheel to Crankshaft bolts must be torqued to 45 ft lbs plus an additional 90 degrees. Pressure plate to flywheel bolts must be torqued to 18 ft lbs and JHM recommends the use of Loctite here as well.